Gardening in the shade is, in a word, tricky. Two to three hours of sun or less in an area limits the choices of plants that will thrive and flower. Add in the height constraint of 12 inches and suitable plants become fewer still. But you don't need to give up on that shaded, bare strip in front of a low rock wall or that tiny corner on the north side of your house. Forming a dense ground cover, hosta "Lemon Lime" grows barely a foot tall and will provide a compact hedging effect along a walkway or a splash of gold at the front of the border. "Lemon Lime" begins the season with yellow foliage that slowly turns to green by midsummer. According to the Missouri Botanical Garden, the purple flowers of "Lemon Lime" are attractive to hummingbirds. For best performance, grow this variety in well-drained, moist soil in partial shade. "Lemon Lime" is hardy in USDA plant hardiness zones 3 through 8. As the common name "green and gold" suggests, chrysogonum has bright yellow flowers rising a foot tall above dense, green foliage. The flowers are star-shaped, hence the plant's other moniker--golden star. Chrysogonum prefers a moist, organically rich soil in partial shade, although it will tolerate drier, less fertile soil conditions. A flush of blooms appear in May, and, in cooler climates, flowering will continue through September. Chrysogonum is hardy in USDA plant hardiness zones 5 through 9. "Purple Gem" is a slow-growing, evergreen rhododendron that reaches 2 feet, but can be pruned back to a foot after flowering with no ill effects. As this variety grows so slowly, pruning may not be necessary for 10 years. Purple flowers appear in May. According to Henning's rhododendron and azalea pages, rhododendrons prefer partial shade and a moist soil with humus mixed in. "Purple Gem" is cold-hardy to USDA plant hardiness zone 6. A North American native, Allegheny spurge, or pachysandra procumbens, grows 6 to 9 inches tall, is deciduous and spreads more slowly than the traditional pachysandra. Van Berkum Nurseries, a wholesale nursery in New Hampshire, describes Allegheny spurge as "rugged" with showy white flowers and foliage in variable shades of green. Hardy in USDA plant hardiness zones 4 to 9, Allegheny spurge, like the traditional ground cover variety, prefers shade and a moist, but well-drained soil. 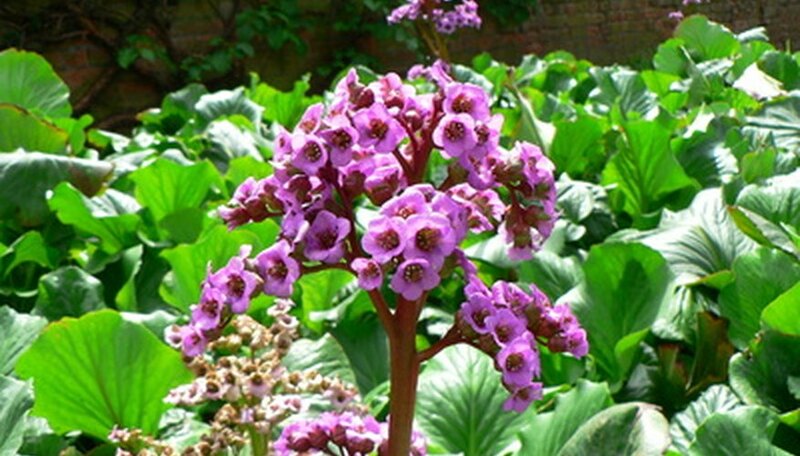 Bergenia is an underused shade plant with thick, almost succulent leaves and pink, red or white flower spikes in the spring. Although most varieties are 18 inches tall, the pink bergenia 'Baby Doll" grows only 10 inches high, and works well as an edging plant. As a rule, bergenias prefer partial to full shade and moist soil. Bergenias are evergreen, but will suffer cold damage to leaves in colder climates. "Baby Doll" and other varieties are hardy in USDA plant hardiness zones 4 to 8. Missouri Botanical Garden: Hosta "Lemon Lime"
Where Can I Buy Lime Button Mum Seeds or Plants? What is the Difference Between Vinca Major & Vinca Minor?